The OCT 3D imaging system has really and truly revolutionised the practice of eyecare. We are now detecting, diagnosing and treating or monitoring eye health issues quicker, more efficiently and with greater accuracy than ever before. The OCT provides a real-time live view of your retina and cornea with a level of detail comparable to that of a low power microscope. We can discern the layers of nerve cells and photoreceptors (the light sensitive parts of the retina) as well as intra-retinal blood vessels. It is particularly useful in the detection and assessment of both macula disease and Glaucoma. An analysis video of the 3D output of a retinal scan for a patient with a normal retinal structure. The video slices through the layers to give a view "inside" the retina itself. Macula disease is defined by a degeneration of the central retina (the bit you use to see detail such as viewing faces and when reading). This deterioration can result in a fluid build up within the retina. This fluid can be seen and quantified using the OCT allowing for more rapid and effective treatment. Glaucoma is a particularly difficult disease to both detect and sometimes treat. The OCT analysis can give an estimate of retinal nerve fibre health and can report upon whether this fits into a normal data distribution. This gives us a highly sensitive analysis allowing us to be confident of a healthy retinal nerve structure and, therefore, detect cases of glaucoma far earlier than before. For more information on either of these conditions please see our information section or click below. Ocular Coherence Tomography is a highly detailed examination of the ocular tissues performed by an infra-red laser scanning capture system. It is completely pain free, rather like taking a photograph but of the inside of your eye and it gives us a real time in vivo (latin for "in the living") assessment of your eye. 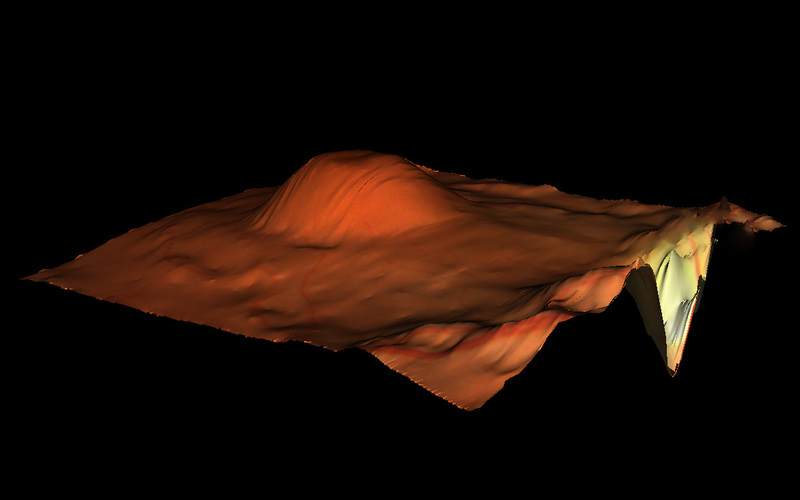 A normal foveal pit seen here as an actual retina photograph overlayed onto a 3D profile of the retina. 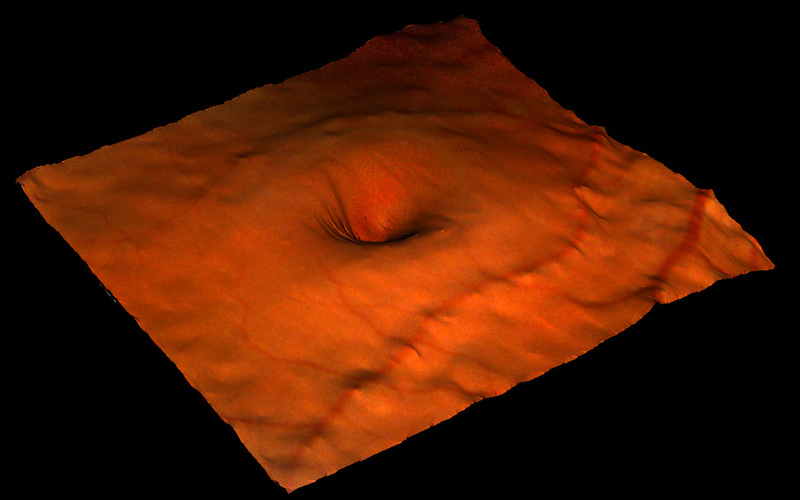 3D image of the OCT scan above in the page header image. The mound you see is a collection of fluid within the layers of the retina. OCT scanning is rather like an ultrasound scan of your eye, however, with important distinction that it uses invisible light rather than sound to create the image. Because light has a shorter wavelength than sound we can achieve much higher resolution and see in much more detail than a conventional ultrasound scan. Infra-red light is focused on tissue within the eye which is then scattered by the various layers and structures of the tissue in varying amounts. As the infra red light then reflects back to the detector the scattered light contains different focusing lengths which is analysed by sophisticated software to produce a three dimensional representation of the ocular tissue structure. The system also takes a conventional photograph of the area of interest which can be point by point registered with the 3D scan allowing direct comparison. We recommend OCT for everyone although it is not a necessary test. OCT gives an unrivaled level of detail to the ocular examination.